Lok Sabha Elections 2019: The Election Commission has given a "free hand to Amit Shah and the PM to spread hatred", she said, adding, the poll body "seems to have shut its ears and eyes when it comes to them". Mayawati has said the Election Commission's 48-hour ban on her campaigning is "murder of democracy" and alleged that the Commission appeared to have taken the decision "in haste", "under some sort of pressure". The Election Commission has given a "free hand to Amit Shah and the PM to spread hatred", she said, adding, the poll body "seems to have shut its ears and eyes when it comes to them". The chief of Bahujan Samaj Party has been barred from campaigning on Tuesday and Wednesday for her comments while seeking votes from Muslims in Deoband last week. Mayawati had asked the Muslims not to "split votes" between the Congress and her alliance. In its order, the Commission pointed out that appealing to caste or communal feelings to secure votes is not allowed under the Model Code, which is a series of dos and don'ts for political parties ahead of elections. "I had made it clear in my explanation that I hadn't sought votes on basis of caste/creed," Mayawati said this evening. "I had only urged Muslims to ensure that their vote isn't divided. I amply stated that I hadn't made remarks against any religion, remarks that vitiate atmosphere. The Election Commission overlooked all this," she said. Though Mayawati is not contesting, she is spearheading the alliance with Samajwadi Party chief Akhilesh Yadav and Ajit Singh in Uttar Pradesh, which sends the highest number of lawmakers to the Lok Sabha. 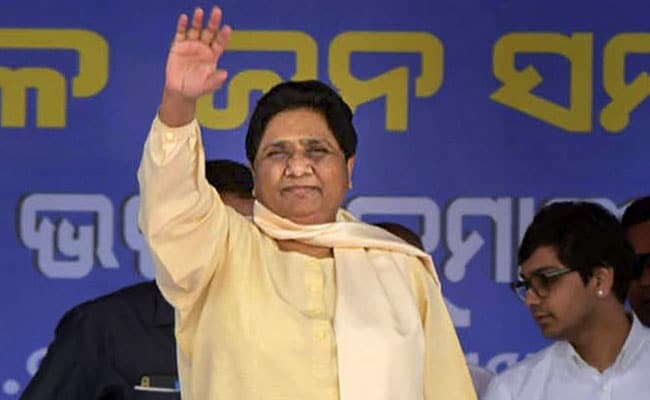 The ban means Mayawati would not be able to address a rally in Agra on Tuesday - the last day before campaigning for the second phase of elections comes to an end. Elections in eight of the 80 seats of the state will be held on April 18. "The decision could have been implemented a day later too... The motive seems that I can't appeal to people of this region," Mayawati said. Earlier today, her alliance partner Akhilesh Yadav tweeted, "EC directive against @mayawati ji begs the question: do they have integrity to stop PM from asking for votes in name of the army?" The Election Commission's order barring Mayawati and Uttar Pradesh Chief Minister Yogi Adityanath from campaigning was announced this afternoon, hours after the Commission was pulled up by the Supreme Court for failing to take action in cases of Model Code violation. A bench led by Chief Justice of India Ranjan Gogoi questioned if the Commission knew what powers it has to punish errant political leaders. Later in the evening, the Commission also issued similar orders for Samajwadi Party leader Azam Khan and Union Minister Maneka Gandhi.